In a medium sized bowl, melt the butter. Add yolks, sugar, flour, milk, baking powder, lemon extract and salt. Beat the mixture until smooth. Leave it separate for half an hour. Beat the white portion of egg until stiff. Mix it with above mixture along with blueberries. 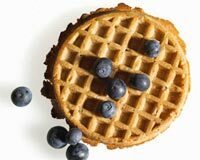 Make waffles according to the maker directions. Serve them with warm sauce.